IN THEIR first cup game of the campaign, Ponteland United entertained Heaton Stannington in a preliminary round of the Longhorn Hardware League Cup. And having already beaten their opponents 6-2 at the Leisure Centre in the league, Jarrod Suddick’s lads completed a double, winning 3-0 on this occasion. In the 30th minute, United’s Sean Willis sent in a firm cross which was headed into his own net by Heaton defender Richard Kerr. Then, 10 minutes later, the generous visitors presented Pont with their second goal. 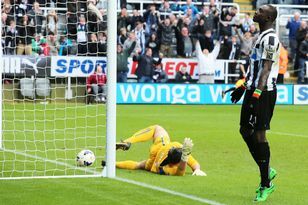 Marc Dummett got on the end of Dominic Clauzel’s free-kick to hit a hopeful drive which Heaton keeper Shaun Backhouse could only punch into the net. Just before half-time the dangerous Willis went down the wing for United and passed to the unmarked Kevin McGorie, who clipped the ball past Backhouse, and the game was effectively over. Another two preliminary ties were scheduled for last Saturday and Walker Central used their home advantage effectively to beat Wallsend Town 3-1. A third-minute opener put away by Ian Mills boosted Walker and the lead was doubled on the quarter-hour by David Thompson. Stephen Dodd got Wallsend off the mark midway through the second half only for the Central’s two-goal advantage to be restored by Ian Dunn. The remaining extra tie in the League Cup – between Peterlee Town and Gateshead Leam Rangers – had to be aborted when Peterlee couldn’t raise a team. As a result they will almost certainly be booted out of the competition and their immediate future in the league is now in some doubt. In first round matches, both of last season’s finalists – holders Carlisle City and Shankhouse – got off to winning starts this time. Carlisle kicked off their defence of the trophy by impressively beating league newcomers Alnwick Town 3-1 at Sheepmount. Two goals for Graeme Lupton scored on either side of the interval discouraged Alnwick. And although they hit back through David McCann, their fate was sealed when Mark Temple scored a third for the Cumbrians. Shankhouse had an easier task compared to Carlisle’s and they also won 3-1 away to Second Division opponents Hexham. Graeme Craggs opened his account for this season with two of the Shankhouse goals and the other was scored by Darren Naylor, with Hexham’s reply coming from Mark Gibson. Premier Division hopefuls Blyth Town and Northbank met up at Craik Park when Blyth’s own ground was unavailable. And the Town ran out 3-1 winners despite trailing to Andy Rogerson’s 10th-minute opener for Northbank. Blyth got going again and Mark Waugh levelled from the spot when Daniel Day was grounded in the 40th minute. The Northumbrians went in front for the first time after the break when good work by Nathan Lajerde created an opening and Brian Cole fired home in a crowded goalmouth. Blyth’s tally was completed by another penalty 10 minutes from the end, put away this time by Cole. Ashington Colliers ended the cup hopes of Second Division hosts Jesmond, winning 3-0 with goals by Lee Sparrow(2) and Glenn Bolton, and Harraby Catholic were equally comfortable 4-0 victors at Wideopen. A first-half hat-trick for Roy Holliday put the Premier Division’s reigning champions in an unassailable position and their tally was completed by Stephen Archibald. Away to North Shields Athletic, Heddon conceded a first-half goal to Stuart Purvis and made hard work of saving the tie. They finally won 2-1 thanks to strikes in the last quarter of an hour by Chris Bell and Liam Heenan. But Seaton Delaval bowed out, losing 2-0 at Cullercoats where the goals in each half came from Steve Hart and James Leggett (penalty). Killingworth YPC, who had earlier beaten Shields United 2-1 in a preliminary round clash, continued their progress with another narrow victory at home to Willington Quay Saints. This time they beat their visitors 4-3 but had to do things the hard way and trailed to goals scored by Andy Duffield, John Amos and Trevor Ford before the interval. Killy rallied after the break and saved the tie with replies from Matt Smith(2), Kevin Westphal and Robert Ruddick. Whitley Bay Town also won 4-3 to end the League Cup interest of visitors Newcastle BT and they too had to come back from a three-goal deficit after BT’s Craig Gilbert, James Dalgleish and Nick Rowling were on target. Chris Atkin then marked his debut with two replies for Whitley Bay whose other goals were scored by Garry Milburn and Richard Biggs with their 80th-minute winner. Newcastle Chemfica guaranteed themselves a second-round appearance in the League Cup by winning 4-2 away to Tynemouth United. Their goals were supplied by Mike Richardson (2), John Connolly and Jimmy Hawkes, while both of Tynemouth’s replies came from Steve Finkill. After last weekend’s action only four first-round matches remain to be played in the League Cup and these are: Newcastle University v Gillford Park, Amble v Ponteland United, Wallsend BC v Gateshead Leam Rangers and Cramlington Town v Walker Central. Meanwhile, in last weekend’s only league game in the Premier Division, Cramlington Town visited Gillford Park, with the winners guaranteed pole position. In the event it was Gillford who did the trick, clinching a 2-1 verdict with goals by Danny Palmer and Daniel Rayson. Nathan Rogerson replied for a disappointed Cramlington. ALNWICK Town are two points clear at the top after winning both of their latest games. WHEN the new Northern Alliance season kicks off on Saturday, the league’s banner will encompass 50 clubs in the three divisions.